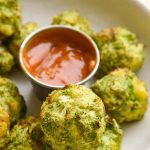 Make our Roasted Broccoli And Cauliflower for meal prep meals or entertaining! This easy sheet pan side dish is sure to please. This is a sponsored post with Thrive Algae Oil, all opinions are our own. 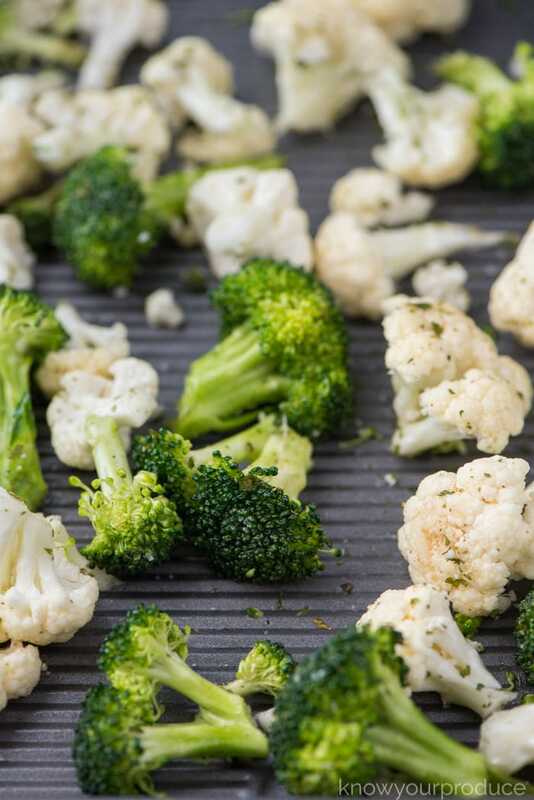 We’re a huge fan of meal prep and love using a sheet pan or an air fryer to cut our time in half. 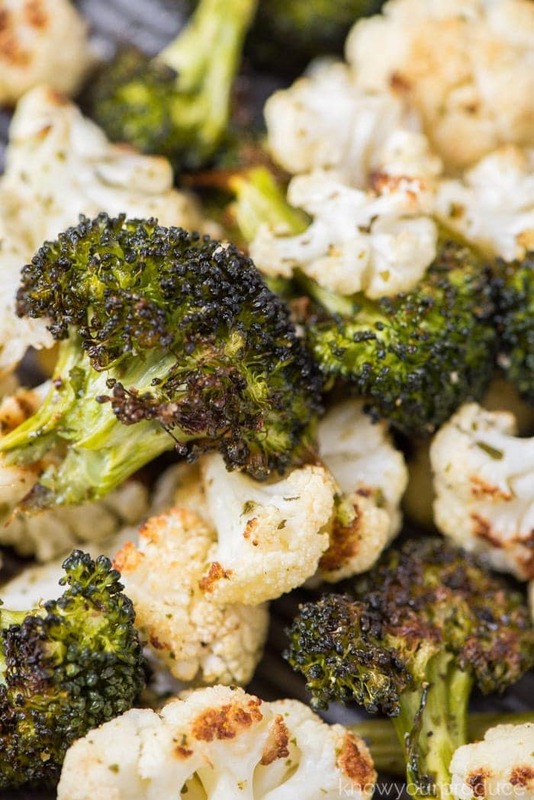 Today we’re excited to share our roasted broccoli and cauliflower. 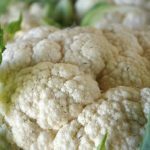 I love tossing this into salads, into a breakfast scramble, or even just noshing on it cold. 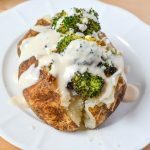 The kids love to dip it into hummus or some greek yogurt which is super flavorful too. Want more veggies? 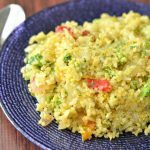 You can also add in some asparagus and even carrots which should cook up quickly if cut small. 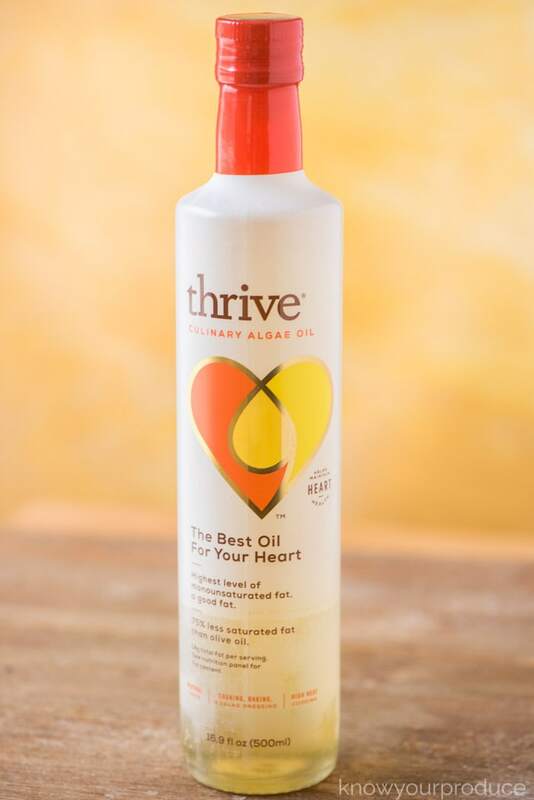 We have started using Thrive Algae oil when we roast things in the oven or even cook on the stovetop. Why Thrive Algae Oil? 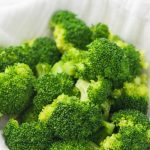 Thrive has a high smoke point (up to 485 degrees), which means it doesn’t burn at high temperatures. Another thing, it has a very neutral taste and doesn’t overpower the main ingredients. This neutral oil is great for searing, roasting, marinating, sautéing, mixing salad dressings, and even making baked desserts. The algae that makes Thrive Oil (grown in fermenters like the kind used to make wine or beer, but originally sourced from the sap of a chestnut tree) is an original source of oil with a neutral taste and good fat, allowing for the high smoke point, making it a great option for our family. 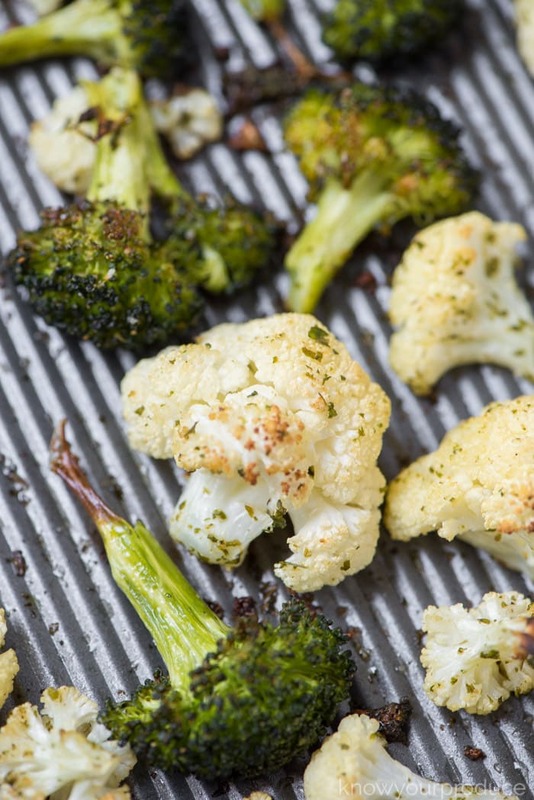 Once you have poured on the oil, you can now season your veggies. We use our all purpose seasoning mix, there’s no spice so kids can enjoy too! 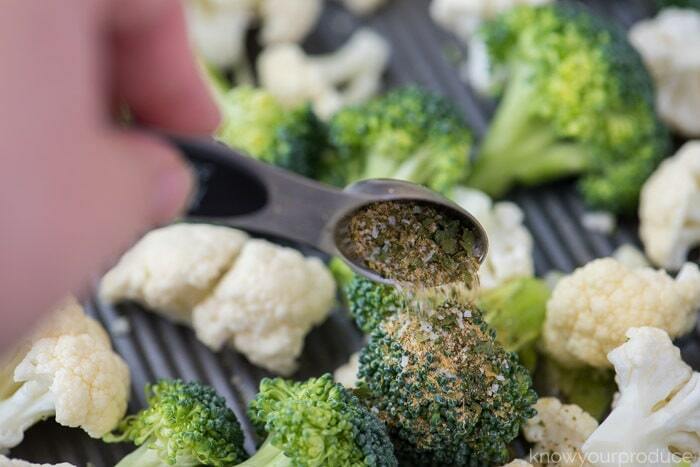 Mix all the broccoli and cauliflower around with the oil and seasonings to get them evenly coated. 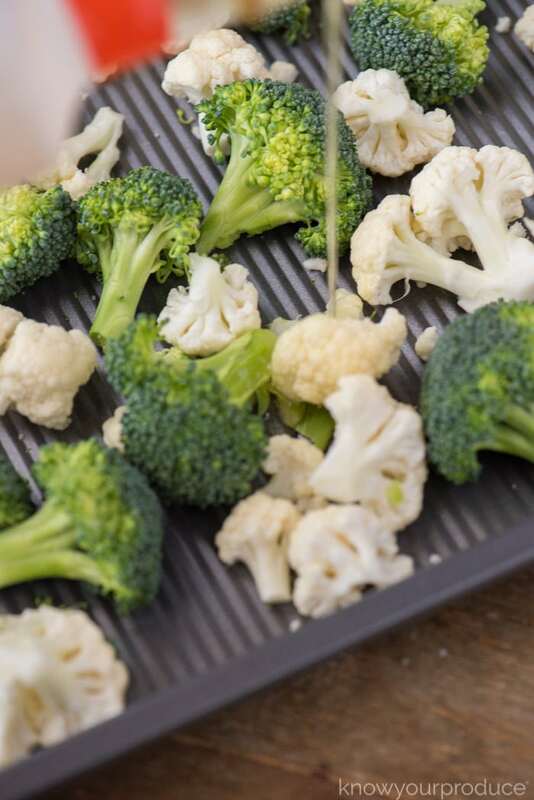 Make sure you give the veggies on the sheet pan some room to cook (don’t put them too close together or overcrowd the pan) if not you’ll end up with steamed veggies, not what we’re going for here. 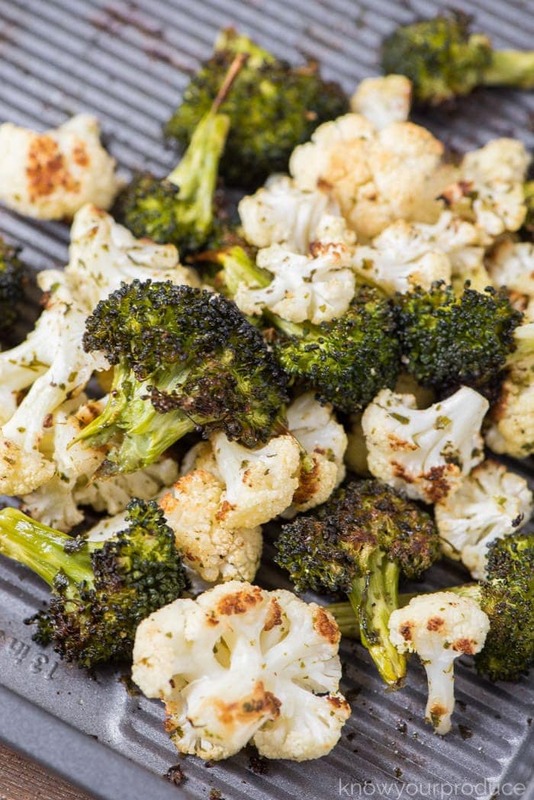 The end result is a flavorful roasted cauliflower and broccoli side dish! You can enjoy as is or like we said, dip into your favorite hummus or yogurt (sour cream works too!). Plus, with Thrive Algae Oil you get more good fat in your diet! You can easily swap this oil for your traditional oils in the kitchen. 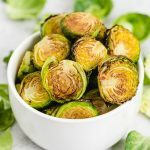 Thrive Oil contains a low amount of saturated fat and a high amount of monounsaturated fat, which is the good fat and excellent for maintaining a heart-healthy diet while you roast your veggies. If comparing to olive oil, it contains 75% less saturated fat. Foods that contain saturated fats are fatty and processed meats, poultry with skin, dairy products like butter, cheese, and milk. A diet rich in saturated fat has been shown to raise your bad cholesterol. When you replace saturated fats with healthy fats you’ll decrease your heart disease risks. 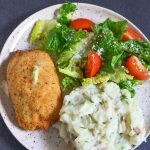 Vegan and vegetarian diets are lower in saturated fats, but a vegetarian diet can be higher due to the consumption of dairy. *Learn more about types of fats and heart disease. 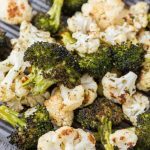 Make our Roasted Broccoli And Cauliflower for meal prep meals or entertaining! This easy sheet pan side dish is sure to please. 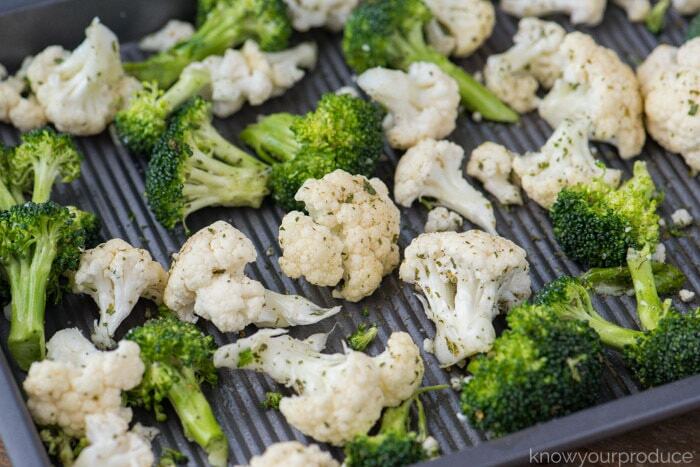 Mix the broccoli, cauliflower, oil, and seasonings together. 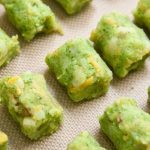 Place the mixed veggies onto a sheet pan and bake for 35-40 minutes, tossing once. 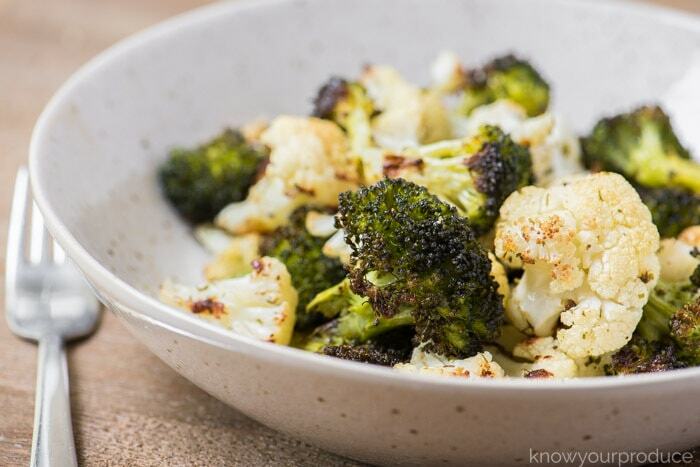 Remove the vegetables from the oven once they start to caramelize and brown.